High gain, low noise, smooth sound. Great as a phase inverter. The Sovtek 12AX7LPS is a long plated spiral filament dual triode. High gain, and low noise, is nicely balanced all around - not bright. Players with combo amps or those who like to play on max volume may want to reconsider, as the 12AX7LPS can be prone to microphonics (due to the long plate). 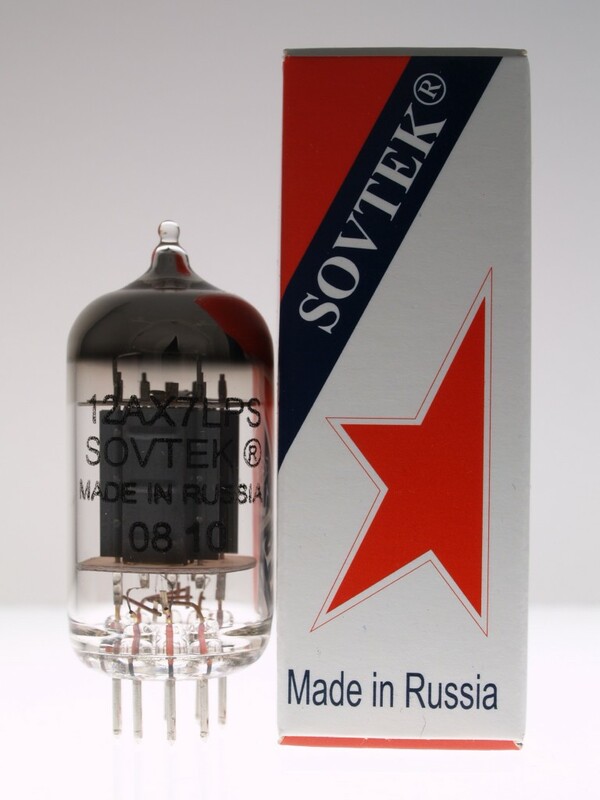 The Sovtek 12AX7LPS is the same tube as the Groove Tubes 12AX7R2. The long plate makes it great in the phase inverter spot, a position which can impact the overall feel of your amp. Avoid these in high voltage cathode follower(CF) spots, these cannot withstand prolonged high voltage. They also don't appear to light up because of the spiral filaments, please listen to your amp before emailing us about a DOA tube! Great Tube! Review by David S.
Boy, the output of my amp is significantly different, AND BETTER, with the Sovtek LPS in the v5 position of my Egnater Rebel 30. You also recommended the Tung Sol in the V1, and the combination of these two with the Ruby HG in v2-v4 is absolutely phenomenal. For my ears, I have never played, heard (or felt) a better sounding amplifier! The tone is now huge and buttery smooth. What low end! These new tubes in the Crema Wheat are incredible, particularly the NOS 6V6’s. What a difference the right combination makes! Thanks for your help. I’ll be back! Thanks for suggestions, now I want to experiment! Finaly got the new tubes in the amp... HOLY CRAP!!!! It's like a new amp - really. Loads of low end and all the bark and gonk I guy could want. Just great! Thanks for the help Doug, I'll be buying from you again.